While many factors contribute to the above statistic, one factor serves as the foundation for so many of the others. So, with a finite amount of resources where should B2B Enterprise marketers focus their efforts for the most impact? On understanding and connecting with your buyer. Think for a minute on the impact of this; truly effective and strategic demand generation must understand the intended participants. If you don’t know your buyers inside and out, there is little guarantee that your demand generation programs will work in the way you expected. Buyer personas drive your content plan as well as the tactics you choose to engage them and an understanding at what point they become a Marketing Qualified Lead (MQL) and are ready to speak with sales. Before you can dictate a content strategy, nurturing logic, or a social media plan you need to know how your buyer consumes content. I know this sounds somewhat trite, but seriously, once you know your customers, program decisions become simple, as all the answers are determined by what supports them. The ANNUITAS study found almost two-thirds of enterprise organizations running more than 15 demand generation programs each year; indicating that the majority of organizations are still focused tactically on demand generation. What if you could reduce that number and be even more effective? What is the number one way to think strategically about demand generation? Aligning to the buyer. 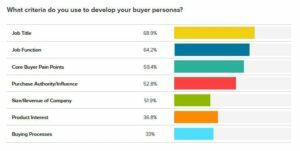 Understanding your buyer has long-term benefits as well, the ANNUITAS survey also indicated a lack of focus on customer retention, “with only 32% of organizations listing this as a goal. Companies are missing a big revenue generating activity by ignoring customer retention and are also putting a larger burden on new logo acquisition to make up for any attrition.” Customer nurturing programs are another way to put those buyer personas to good use. So how do you get to know your buyer? Develop data driven insights for each of the personas. Understand their world from beyond your product or service, as this will shape your content marketing plan and engagement strategy. Find out how they buy, understand the entire process as it often begins much earlier that you think. Next, learn how they consume content and what their preferences are regarding communication. Finally be sure to look at your own internal marketing and sales processes, and make sure they’re aligned as well. Taking the time to reset your Demand Generation Strategy around the buyer in 2015 will have far reaching implications. In the meantime, make sure to download the complete 2014 ANNUITAS B2B Enterprise Demand Generation Survey results and see how your organization measures up to your peers.